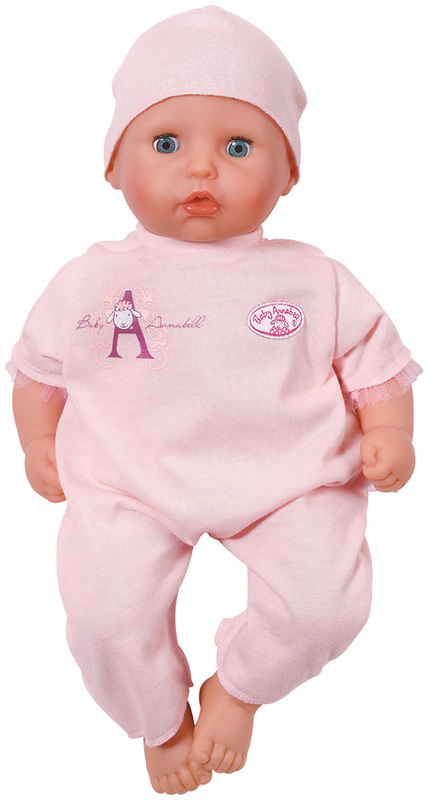 Voted 'Girl's Toy of the Year' in 2000, Baby Annabell continues to be as popular as ever. Thanks to modern miniature electronics, some versions of Baby Annabell will turn her head in the direction of the voice she hears, gurgles when sucking her dummy and cries real tears if her owner doesn’t give her enough care and attention! Little girls don’t just want the modern gizmos though - Baby Annabell dolls are still soft, pretty, charming and perfectly huggable. Made by German company Zapf Creation, Baby Annabell dolls are only part of a popular range which includes Baby Born and Chou Chou, plus her smaller cuddly sister, My First Baby Annabell. Some of the charm and fun for little girls is to dress Annabell in her favourite clothes and take her for a walk in her own stroller. Annabell even has her own raincoat and wellies if the weather is really bad. Her accessories include blankets, bottles and socks, as well as hangers for all those gorgeous outfits which can go in her own wardrobe. Her cot and changing table in the make-believe nursery ensures she is well cared for. Such is the popularity of Baby Annabell, that Zapf make a large selection of different models to satisfy the demand from its doll loving little girl customers. Some examples include Baby Annabell Care For Me Doll, Baby Annabell Brother and an electronic version that reacts to its owners voice. Baby Annabell Let’s Play version is supplied with a gorgeous plush sheep toy whose lovely soft coat is dyed pink to match Annabell’s outfit. By incorporating several realistic and interactive features into this doll, Zapf have created a toy where little girls as young as two can learn about nurturing and caring for babies. When children hold Let’s Play under her arms she’ll giggle and laugh - and she always prefers being fed on her left side. The right side elicits a serious of uncomfortable burps! Laying her gently on her back induces a pattern of deep sleep, but pick her up again and she’s ready to play with plenty of giggles. Please tell us what you think of the Baby Annabell Dolls by Zapf Creation.